Hi! It's Jilly. 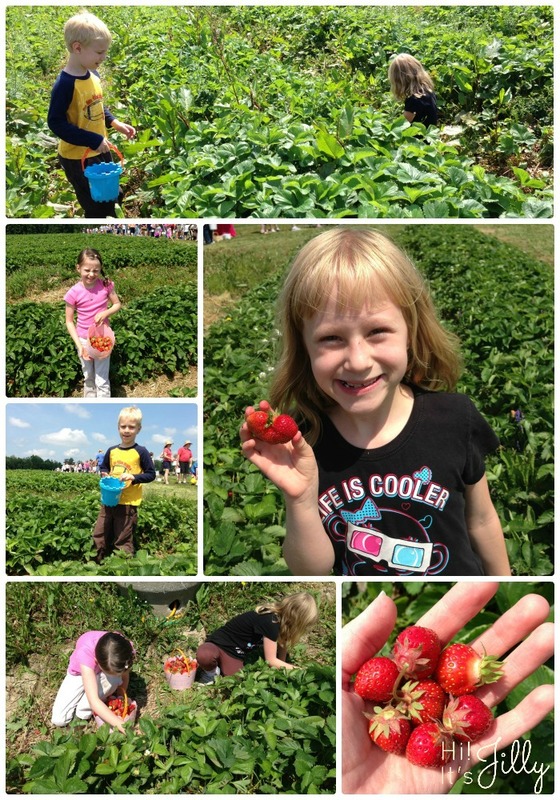 A couple weeks ago we met some friends for the opening day of strawberry picking! It was a beautiful day, but got hotter the closer it crept towards noon! It's amazing how much better fresh picked strawberries taste! Yum! Might be linking up with: Craft-O-Maniac, C.R.A.F.T, I Should Be Mopping The Floor, More the Merrier Monday, Make the Scene Monday,Serendipity and Spice, Home Stories A to Z, Titus 2 Tuesday, Take It On Tuesday, Work It Wednesday, What We Wore, Read, and Made Wednesdays, Show & Tell Thursday, The DIY Dreamer, House of Hepworths, Mom on Timeout, Create It Thursday, Pinterest Power Party, My Favorite Finds, Weekend Wonders, My Turn For Us, Fancy This Friday, Sew Crafty Angel , Friday Favorites.